Happy Thursday!! 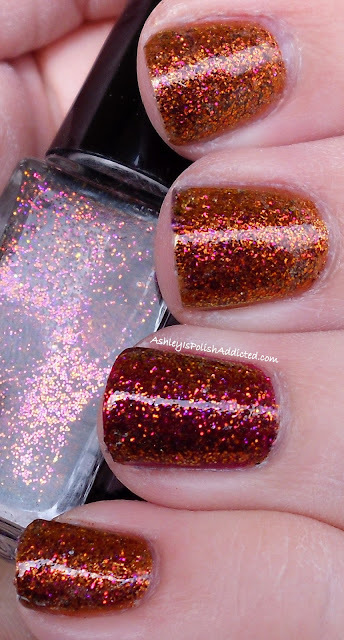 I have an amazingly gorgeous perfect-for-autumn polish for you tonight! Enchanted Polish Ola Rio is a multi-chrome glitter polish that shifts so many different colors! I see orange, gold, pink, copper, fuchsia and even a little green (I couldn't capture the green in the photos though.) 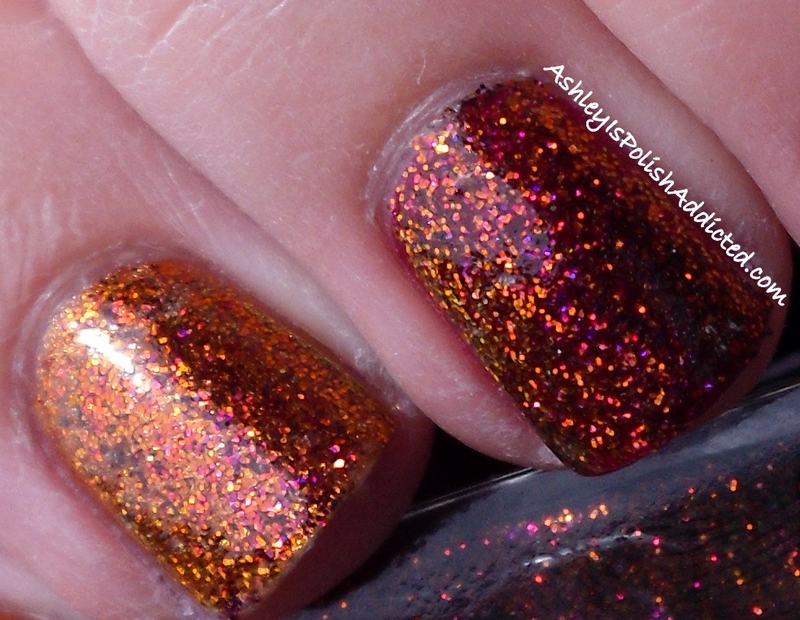 This is a very dense glitter and could easily be worn alone in 3-4 coats. I used 2 coats over my base (China Glaze Harvest Moon and Zoya Blaze on my accent finger) with one coat of Poshe to top it off. Application was a breeze, absolutely no issues at all. Ola Rio is part of the Big City Lights Collection.This collection can be purchased through Harlow & Company, MeiMei's Signatures and Llarowe. Be sure to follow Harlow & Company on Facebook, MeiMei's Signatures on Facebook, Llarowe on Facebook and Enchanted Polish on Facebook for information, availability and updates. Enchanted Polishes retail for $15 for a full .5 oz bottle. Ooohh so so beautiful!!! Really reminds me of all the leaves changing colors outside!! Oh thats awesome! It's like fire sparkle. I'd be torn which base to wear it over of those two, great picks! !